2012 has seen the Queen's Diamond Jubilee and the London Olympics, so remember them in style with with this vintage style cake stand. 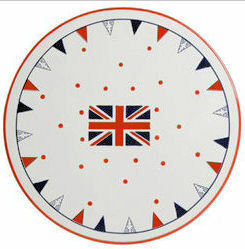 With a delightful red, white and blue Union Jack and bunting design, this makes an ideal gift. Street Party CAke Stand; retro style!